Tradition is a word that is often associated with the martial arts, namely its past. Time has a strange way of embellishing the truth. Some of the early progenitors of martial arts have been attributed with almost demigod-like magical powers. Stories that include the ability to shuto through a tree trunk, or disappear in a flash of light are obviously absurd, but did serve a function. In his book, Tales of Okinawa's Great Masters, Shoshin Nagamine writes, "In general, these stories are positive and serve to teach important lessons." It was the inspiration derived from these legends that was supposed to motivate the practitioner to great heights. The perception of martial arts when it first arrived in the West was that it could transform mere mortals into invincible fighting machines. In part, we can thank the movie industry for that. The rest has to do with the human invention of myths. Carl Jung said the need to create legends and heroes - archetypes as he called them, is innate in everyone. But reality can assert itself in sobering ways. The Boxer Rebellion of 1900 is the classic example. This was an attempt by, among others, renowned Chinese chuan fa masters of the time to overthrow the government. The insane notion was that the supernatural/martial prowess of these men could somehow prevail over bullets. The Japanese samurai also rejected use of the firearm, because it was so "graceless" to use. Legends tend to outlive the heroes, despite the latter's noble intentions. I can see how the phenomenal feats described could encourage martial artists to go for a little bit more in their training. Who knows the potential ability that can be unleashed through effort? 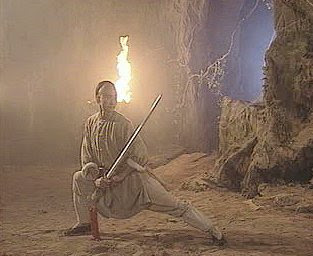 I know that I find Martial Arts films really inspiring - even though I know that there is wire-work, etc involved in their making. Maybe they're our modern myths. Great post again, by the way. Indeed, who knows? We all have amazing potential waiting to be actualized. Do they still use wires with all these computer generated tricks? Clearly, some martial arts films (not flicks) are more inspiring than others. ..According to the Chinese legends There were once 5 students who survived the destruction of the Shaolin temple. These 5 survivors were able to escaped the ambush of the Qing's imperial army who felt threatened by the monks martial arts abilities. Later these 5 survivors formed a secret society of brothers known as 'Tiandihu' Heaven and Earth society. They became the 5 elders who swore an oath to fight and protect their people, to overthrow the corrupt government and restore the Ming government. The people of China funded their cause. These 5 elders also gave birth to what we know as the Southern style fists of Shaolin. Inspired deeply by their legends, many styles of Kungfu came from their influences.. Sounds familiar. There's a similar story to that one that involoves the creation of Wing Chun, the first style studied by Bruce Lee. Although it's debatable, Shaolin is regarded as the ancestral system for most of the modern empty-handed Asain combative styles. Thanks for your input, Eddie. The story continues into a darker area - apparently these branches of Kung Fu are also the roots of the present-day Chinese gangs. Wonder if there's any truth to that? And yes, John, to answer your question, they do still use wires in some cases. The wires are then digitally removed in post-production. ...the legend continues as when the corrupt goverment was finally overthrown and the country was restored, secret societies were no longer needed, as a result some have move on with martial arts and others have turned to illegal activities to survive. These people are known to be modern terms as Triad Socities. The ceremonies, the ettiquettes, the laws might still remain to symbolise their origins but their means to exist might have gone astray from the original purpose. The Chinese gangs/Secret Societies it seems had noble intentions at first -- much like the Sicilian mob. Talk about "going astray"! So, they still use wires in those movies...what was I thinking? Thanks for all the info. Be well. In a day where ak-47 didn't exist, maybe they were right. Although it's americanized, the last Samuraï movie shows a bit of what it seems to have been like in those days. Just goes without doubt that with all good inventions comes the bad. Nevertheless, I still believe in mankind. Legends surely helped motivate each to become better. Who knows the full potential of our minds?